You’ve seen those guys with abs that make a V cut above the pelvis at your gym and on countless fitness pins. A powerful abdominal workout and some smart fat-cutting decisions can help you to achieve that V cut that makes you envy them. Make sure the moves you make are really smooth and slow. To make it even harder, you can hold a weight between your feet. Again, move slowly during the entire exercise to really feel your abs tightening. Keep your legs straight. If this is too easy for you, add some weight between your feet. You can make the reverse crunches more difficult by holding a dumbbell between your feet. Hold this V position until you feel the burn in your abs, usually about 30 seconds to 2 minutes. Side crunches to hit both your obliques and your central ab muscles. Hip bridges to strengthen the lower back without straining it. Lunges to strengthen your thighs, glutes, hips, back, and improve your sense of balance. Yoga poses to improve your core strength, and increase flexibility and balance. Cut sugary, fatty foods from your diet(except for rare indulgences). Get lean protein. Here is a list with top 10 protein sources you should integrate into your diet. Eat fresh, organic fruits and veggies to get all the nutrients your body body needs. Eat fewer carbohydrates, but don’t cut them out of your diet. I guess you already know you shouldn’t starve yourself. Depriving your body of the food and nutrients it needs will leave you irritable and tired. So the workout you’ll perform to build your V cut muscles won’t be as effective as it should be. Cardio exercises don’t require special equipment (just a pair of sport shoes maybe) or financial investment, that’s why they’re great for everyone. Walking, jogging, running, cycling, hiking and swimming are enjoyed by millions of people all over the world every day. One of the most simple, intense and effective cardio exercises is running. Balance short distance sprints with jogging and/or walking to boost your metabolism. Learn more about cardio exercises. Drink plenty of water every day to stay hydrated, alert and healthy. Many diets recommend at least 2 liters of water per day. You should perform some resistance training like weightlifting or body weight workouts to improve your form and reduce the muscle loss during your weight loss process. Remember to never jump straight to high-weight exercises, just start slowly. Consider walking, running, or biking instead of driving to work. If you work in an office, get out of your chair as many times as you can (at least 5 minutes every hour) and consider investing in a standing desk. Instead of relaxing in front of the TV, opt for an active relaxation like some simple exercises on the floor. You can’t build your V cut abs overnight. Once your V cut abs become slightly visible, challenge yourself with more advanced workouts. 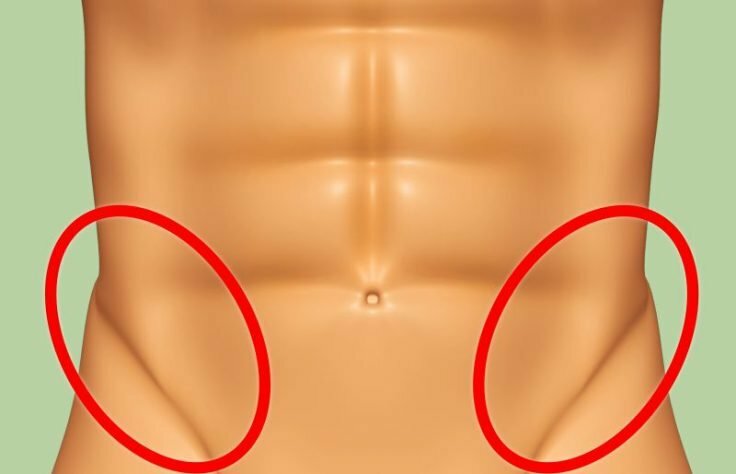 If this article was helpful, please share it with others and help them build their V cut abs. Stay fit!